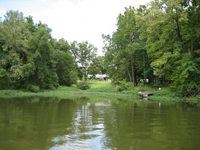 Curl & Associates, Inc. is currently working with the City of Centralia on the restoration of Raccoon Lake. Raccoon Lake is a 725 acre water supply lake built in 1943 that has lost approximately 1/3 of its storage volume due to siltation. The restoration plan includes the construction of settling basins to hold dredged materials and sediment traps used to intercept new sediment for the future protection of the lake. This project will require coordination with the Illinois Environmental Protection Agency and the U.S. Army Corps of Engineers to secure the necessary permits for dredging, wetlands, construction of settling basins, and sediment traps. Funding sources include local, state, and federal agencies. Aerial photo of Raccoon Lake. The top of the picture is north. 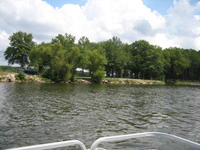 One of Raccoon Lake's shore lines taken from a boat on the water. Another of Raccoon Lake's shorelines.